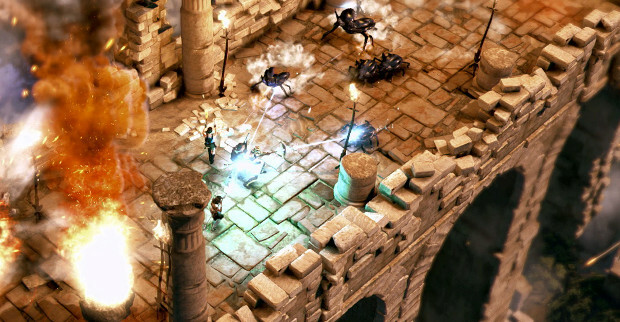 Have You Played Lara Croft The Guardian Of Light? My favourite part of Tomb Raider has always been seeing forgotten spaces and exotic landscapes, with all the key-collecting, dull puzzles, and (until recent games) wonky combat being the price I had to pay to enter exciting new places. Lara Croft and the Guardian of Light [official site] is less good at awe, but the top-down shooter spin-off makes up for it by smooshing action, puzzles, and platforming into one big merry romp. It’s a cracker of a co-op game too. You probably like action games. But which ones should you like best?! We’ve narrowed it down to 25, and then put them in the unimpeachably correct order. Read on for details of the best action biff-zap-collect-me-do gaming you can stuff down your trousers. Well lah-di-dah, look at Lady Croft, hob-nobbing with ancient Egyptian gods. Don’t Horus and Isis know what she gets up to at weekends? She stole that dinner set too, you know. You can still see the bloodstains. I can’t imagine why they’re keeping company with her. For all I know gods are fond of that blood and murder, though. Dreadful heathens. I tell you Alice dear, I wanted them to turn down my invitation to afternoon tea. Deary me, sorry readers. I popped out the room to make a cuppa before tackling the announcement of Lara Croft and the Temple of Osiris and my grandmother Alice (it’s a family name) starts trying to send me an e-mail about a video game as if the characters and events contained within were real ha ha grandmother what a hackneyed literary device.